Yesterday’s game against Oklahoma marked Tyrone Swoopes’ best performance as a starting quarterback for the Longhorns. With a QBR of 78.2, Swoopes’ 27 of 44, 334 yards, 2 TD, and 1 interception performance is far from legendary, but it does show a pronounced improvement, and an improvement on the biggest of stages, no less. More importantly, the performance also marks the second game in a row that Swoopes threw for more yards and a higher completion percentage than the opposing quarterback, despite the oppositions’ Heisman credentials or Katy Perry shoutouts. With the defense playing as well as any in the country, the offense has become a proverbial punching bag for the Longhorn faithful, and understandably so. However, despite a 2-4 start, the offense is improving. The Baylor game, as they seem to have become on a weekly basis, was unconventional, and Swoopes’ horrid performance was still arguably more efficient than Heisman hopeful Bryce Petty’s. So, if that game is an asterisk, we see a noticeable improvement each week from Swoopes. 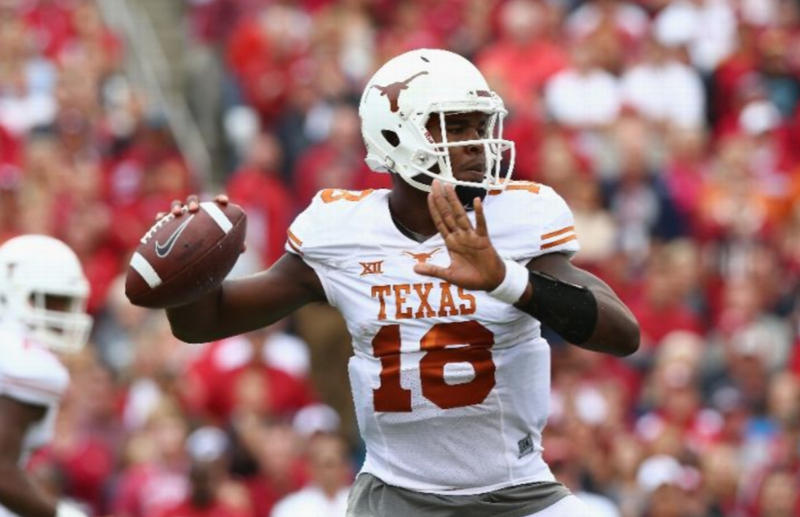 The offense is putting more trust in Swoopes’ arm and his ability to throw the ball further down field. Though this brings more risk, and interceptions into the equation, it results in more yards and a more confident quarterback. We’ll see if the sophomore quarterback can continue this upward trend next week against Iowa State.